Property 2: Seascape One - located in the heart of Palm Beach. Great family location! Availability still over Easter! Due to cancellation... hurry dates fill fast! Property 6: Availability still over Easter! Due to cancellation... hurry dates fill fast! Bright and Breezy - Dog Friendly - Min. 4 night stays! Property 10: Bright and Breezy - Dog Friendly - Min. 4 night stays! 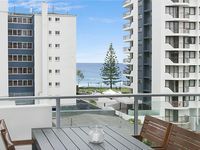 Property 19: Kirra Vista 9 - Kirra Beachfront - Min. 3 night stays! 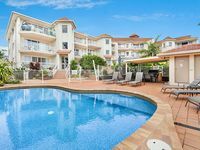 Calypso Plaza 419 - Coolangatta Beachfront! Property 20: Calypso Plaza 419 - Coolangatta Beachfront! Calypso Plaza 335- 337- Coolangatta Beachfront! Property 21: Calypso Plaza 335- 337- Coolangatta Beachfront! Welcome to Waves 101 Absolute Beachfront Beach Apartment. Property 23: Welcome to Waves 101 Absolute Beachfront Beach Apartment. Ocean Plaza 1577 - Coolangatta Beachfront! Property 30: Ocean Plaza 1577 - Coolangatta Beachfront! Rocks Resort 4G - Currumbin Beachfront - Min. 3 night stays! Property 31: Rocks Resort 4G - Currumbin Beachfront - Min. 3 night stays! Springtide @ Rainbow Bay - Ground floor, beach on your doorstep! Property 36: Springtide @ Rainbow Bay - Ground floor, beach on your doorstep! Blue Haven - Absolute Beachfront - Min. 3 night stays! Property 46: Blue Haven - Absolute Beachfront - Min. 3 night stays! This unit in Eden apartments is great &amp; our family has a great holiday. The apartment is very clean, nicely decorated &amp; so close to beaches &amp; shops. We will definitely stay again. Oceanview is an ideal holiday rental for 4 people in a great location within walking distance to all amenities in Coolangatta. The very secure complex with parking is quiet and peaceful away from the hustle and bustle of the Gold Coast. The sparkling clean pool and bbq area is a wonderful bonus to an already well priced rental. With 2 bathrooms and a front load washing machine and dryer, Unit 3 was a great relaxing retreat. The unit is very clean and clutter free with new carpet in both bedrooms. The dishwasher was a nice extra. We can highly recommend this holiday rental which only has a few steps to the entry.